Yesterday's post about home sales in the 32308 zip code was well received and generated quite a few comments and emails from readers, so today I will follow it up by evaluating and creating the neighboring 32309 real estate report. The 32309 zip code is home to some very popular Tallahassee neighborhoods, such as Killearn Estates, Killearn Acres, Foxcroft, Arbor Hill, and Chemonie Crossing. 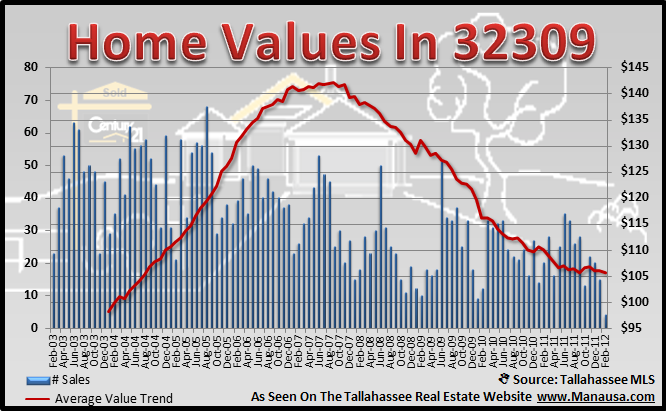 Much like the 32308 zip code, the 32309 real estate report could well be classified as the heart of residential Tallahassee. If you need to sell a home in the 32309 zip code, then I urge you to take a close look at our targeted home selling plan, as more homes that hit the market in 2012 will fail to sell than will find success. Falling values leaves failed home sellers with a home that will sell for even less next year. Average home prices in the 32309 real estate report are still rising. We know from past reports that often times the average price of homes in a certain area might be on the rise, even when property values are falling. That trend is evident in the 32309 zip code. The real estate graph below shows that buyers are taking advantage of very-low interest rate loans to grab "more house," meaning that just because values are falling does not mean that buyers are going to spend less. Instead, they are choosing to get more house for the money. The graph below shows that home values in the 32309 real estate report continue to fall and have dropped below an average of $105 per square foot, a level last seen in 2004. That means current values are consistent with values in late 2003, and we know that they will continue to fall as the glut of supply continues to pressure a market that is struggling to stimulate demand, due to the thousands of potential buyers who are current trapped in a home with more mortgage than value. 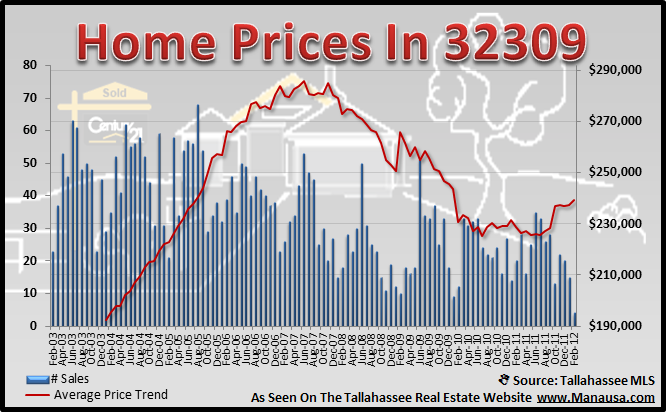 Please come back again to find the continually updated 32309 real estate report as well as other updates about home sales in Tallahassee.